Tails of Courage is hosting their first annual 5k Run and Fun Walk fundraiser to raise awareness and funds to support their animal rescue mission. Tails of Courage is a no-kill shelter that strives to connect as many community members with animal companions of all shapes and sizes. Tails of Courage is encouraging people and pets of all ages to participate in the event. So come “run with the pack” through the streets of City Center Danbury, it’s going to be Pawsome! 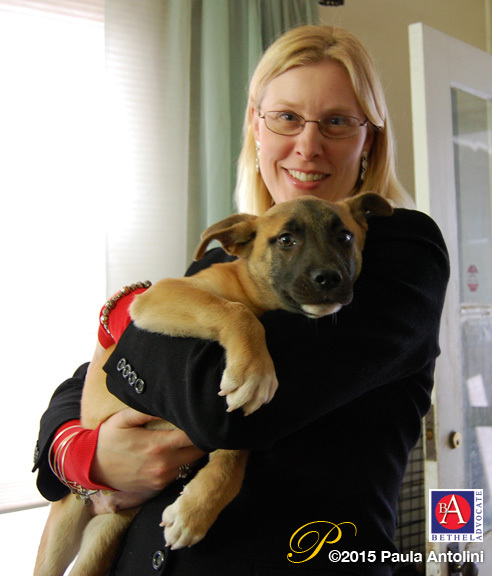 Above photo: Kristan Exner, owner, Tails of Courage. Click here for interactive race course map. T-Shirts will be provided to the first 150 registered participants and prizes will be awarded to the top 3 female and male finishers. Cost to enter is $30. Same day registration is available with unlimited slots. Any questions email runyourrace@tailsofcourage.org or call 877-63-TAILS, Ext 705. Tails of Courage is located at 39 Smith Street in Danbury. Sponsors for the race include: New Balance, Starbucks, Stew Leonard’s, 98Q Radio, Rita’s Ice & Frozen Custard, The Downtown Dog, Vanguard Logistics, Pet Valu and Culligan. WHERE: Start and finish at the Danbury City Center Green. Course runs down Main Street to Rogers Park and back. The course is a certified runner’s course for qualifiers for larger races and marathons. WHEN: Saturday, August 29, 2015. Registration ends at 8:00 am and the race kicks off at 8:30 am. Celebrity Actor Thorsten Kaye from the television soap opera The Bold & the Beautiful will be in attendance. Thorsten has also appeared in the shows All My Children, One Life to Live, and will appear in a 2016 film But Deliver Us from Evil. Also to attend are Danbury Mayor Mark Boughton and several other state and local dignitaries to kick off the race. I just want to tell you that I’m new to blogging and site-building and definitely liked you’re website. Most likely I’m going to bookmark your website . You surely have fabulous article content. Appreciate it for sharing with us your web page. Imagine if you could have a sports betting system that can be truly profitable. Click the link here to learn more. Hiya, I am really glad I have found this information. Today bloggers publish only about gossips and net and this is actually frustrating. A good website with exciting content, that’s what I need. Thanks for keeping this web-site, I will be visiting it. Do you do newsletters? Can’t find it. You actually make it appear really easy together with your presentation however I in finding this topic to be actually something that I think I would never understand. It kind of feels too complicated and very huge for me. I’m looking forward in your next submit, I¡¦ll attempt to get the hang of it! hi!,I love your writing so so much! proportion we keep in touch extra approximately your post on AOL? I require a specialist on this area to resolve my problem. Maybe that is you! Having a look ahead to peer you. Thank you for sharing excellent informations. Your site is so cool. I am impressed by the details that you¡¦ve on this site. It reveals how nicely you understand this subject. Bookmarked this web page, will come back for more articles. You, my pal, ROCK! I found just the info I already searched everywhere and simply could not come across. What an ideal website. I am commenting to make you know what a brilliant encounter my cousin’s daughter experienced visiting your webblog. She came to find so many details, with the inclusion of what it’s like to possess a marvelous coaching heart to get a number of people really easily have an understanding of some problematic subject areas. You really surpassed her desires. Thank you for distributing these essential, trustworthy, educational as well as unique tips about this topic to Lizeth. I have learn a few just right stuff here. Certainly worth bookmarking for revisiting. I wonder how much attempt you put to make this kind of excellent informative site. magnificent publish, very informative. I’m wondering why the opposite specialists of this sector do not realize this. You must proceed your writing. I am sure, you’ve a great readers’ base already! I want to convey my passion for your kind-heartedness supporting people who need help on in this subject matter. Your personal commitment to getting the message across appeared to be extraordinarily important and have in every case empowered many people just like me to attain their targets. Your amazing warm and friendly guide signifies a whole lot a person like me and somewhat more to my mates. Many thanks; from each one of us. Thank you a lot for giving everyone such a spectacular chance to read articles and blog posts from this blog. It’s usually very lovely and stuffed with a good time for me and my office colleagues to search your website at least thrice in a week to find out the new guidance you have got. And of course, I am just actually amazed for the impressive information served by you. Certain 4 tips in this post are rather the finest we’ve had. I intended to create you a tiny word to help thank you so much the moment again on the stunning tricks you’ve shown on this website. This is certainly generous with you to grant freely precisely what most people might have sold for an e book to end up making some dough for themselves, principally since you could possibly have tried it in case you wanted. The secrets as well acted to become easy way to know that some people have the same fervor the same as my own to understand good deal more with respect to this matter. I’m certain there are several more enjoyable sessions up front for folks who browse through your blog post. My husband and i have been now more than happy John could do his survey with the ideas he grabbed out of the weblog. It is now and again perplexing just to possibly be freely giving tactics that people today could have been selling. And we all fully grasp we’ve got the website owner to appreciate for this. All the explanations you made, the easy website menu, the friendships you can help to foster – it’s got all astonishing, and it is assisting our son and our family reason why that subject matter is brilliant, which is certainly really vital. Many thanks for all the pieces! I¡¦ll immediately grasp your rss feed as I can’t to find your e-mail subscription link or e-newsletter service. Do you’ve any? Kindly allow me know in order that I could subscribe. Thanks. Great site. Lots of useful info here. I am sending it to several pals ans additionally sharing in delicious. And obviously, thanks in your sweat! I must show my passion for your kindness in support of visitors who should have guidance on that subject matter. Your special dedication to passing the solution across appears to be surprisingly useful and have consistently enabled ladies much like me to realize their endeavors. Your personal helpful help and advice indicates a great deal a person like me and somewhat more to my colleagues. Thank you; from all of us. great points altogether, you simply received a new reader. What may you recommend in regards to your submit that you made a few days ago? Any certain? Normally I do not read article on blogs, however I wish to say that this write-up very forced me to check out and do so! Your writing style has been amazed me. Thank you, quite nice post. It’s appropriate time to make some plans for the future and it is time to be happy. I have read this post and if I could I desire to suggest you few interesting things or suggestions. Perhaps you can write next articles referring to this article. I want to read even more things about it! Thanks , I have recently been searching for info approximately this subject for a while and yours is the best I have discovered so far. But, what about the conclusion? Are you positive about the source? I in addition to my buddies came taking note of the nice advice on your site while then got a horrible feeling I never expressed respect to the blog owner for those techniques. The ladies became so excited to read through all of them and now have truly been making the most of them. Appreciation for truly being considerably kind and then for finding such high-quality guides most people are really needing to know about. Our sincere apologies for not expressing appreciation to you earlier. I was just looking for this information for a while. After 6 hours of continuous Googleing, at last I got it in your site. I wonder what’s the lack of Google strategy that do not rank this kind of informative sites in top of the list. Generally the top websites are full of garbage. It is truly a nice and helpful piece of information. I am glad that you shared this useful info with us. Please stay us informed like this. Thanks for sharing. I must get across my appreciation for your kind-heartedness in support of those people who absolutely need guidance on this one concern. Your personal dedication to passing the solution throughout had become extraordinarily informative and has always permitted those much like me to attain their dreams. This important facts implies this much a person like me and even more to my fellow workers. Thank you; from each one of us. I truly wanted to make a simple comment to be able to say thanks to you for all the splendid steps you are giving at this site. My long internet look up has now been honored with reliable points to go over with my good friends. I would declare that most of us site visitors actually are undeniably blessed to dwell in a really good place with many awesome people with very beneficial tips and hints. I feel pretty fortunate to have seen the webpage and look forward to tons of more fun minutes reading here. Thanks a lot once again for a lot of things. I¡¦ve been exploring for a little bit for any high quality articles or blog posts in this sort of area . Exploring in Yahoo I at last stumbled upon this site. Studying this info So i¡¦m satisfied to exhibit that I have a very just right uncanny feeling I discovered exactly what I needed. I so much for sure will make certain to do not fail to remember this web site and give it a look on a relentless basis. I want to show appreciation to the writer just for bailing me out of this type of matter. Just after looking through the world-wide-web and seeing proposals which were not helpful, I believed my life was over. Living devoid of the solutions to the issues you have fixed through this posting is a critical case, and those which may have in a wrong way damaged my career if I had not come across the website. Your personal competence and kindness in playing with every item was important. I don’t know what I would’ve done if I had not encountered such a thing like this. I can also at this point look ahead to my future. Thank you very much for this impressive and sensible guide. I will not think twice to refer your blog to any individual who needs to have tips on this problem. I¡¦m not sure where you are getting your information, however good topic. I needs to spend some time studying more or understanding more. Thank you for fantastic information I used to be on the lookout for this information for my mission. I am just commenting to make you understand of the extraordinary discovery my cousin’s princess experienced going through your blog. She figured out many pieces, not to mention what it’s like to have a wonderful helping heart to let the mediocre ones clearly understand a number of grueling subject areas. You undoubtedly surpassed our own desires. I appreciate you for coming up with such precious, dependable, revealing and cool tips about that topic to Gloria. Thank you for any other informative site. The place else may I am getting that kind of info written in such a perfect approach? I’ve a venture that I’m simply now running on, and I have been at the glance out for such information. Hiya, I’m really glad I have found this information. Today bloggers publish only about gossips and internet and this is really frustrating. A good site with exciting content, this is what I need. Thanks for keeping this web-site, I will be visiting it. Do you do newsletters? Can’t find it. I was just looking for this information for some time. After 6 hours of continuous Googleing, finally I got it in your website. I wonder what’s the lack of Google strategy that don’t rank this type of informative websites in top of the list. Usually the top web sites are full of garbage. whoah this weblog is excellent i really like reading your articles. Keep up the great work! You already know, lots of individuals are looking around for this info, you can aid them greatly. Thank you for another great article. Where else may just anybody get that kind of info in such an ideal approach of writing? I’ve a presentation subsequent week, and I am on the look for such information. excellent issues altogether, you just gained a brand new reader. What may you suggest in regards to your submit that you made some days ago? Any sure? I want to express some thanks to the writer for rescuing me from this setting. Because of checking through the world wide web and meeting opinions which were not productive, I figured my life was done. Being alive without the presence of approaches to the problems you have solved by means of your main short post is a serious case, as well as the kind which may have negatively damaged my entire career if I had not noticed your blog. Your training and kindness in handling all the details was precious. I don’t know what I would’ve done if I had not come across such a solution like this. I can also at this time relish my future. Thanks for your time very much for your expert and amazing help. I won’t be reluctant to refer your web page to any person who wants and needs care about this matter.